Learn how to remove the password screen from your Windows 10 desktop or laptop computer. This will save you from entering password if you frequently leave your computer seat and go away. Jim is a guy who has to go away from his computer every now and then for some work. By the time he returns, he finds his computer gone to sleep. And he will have to enter password every time he comes back to his seat! So, not surprisingly, Jim would like to remove password from his Windows 10 computer. Well, if Jim is perfectly sure that nobody else can access his computer then skipping the password screen could really be helpful. Imagine your computer instantly wakes up when you come back to your seat! 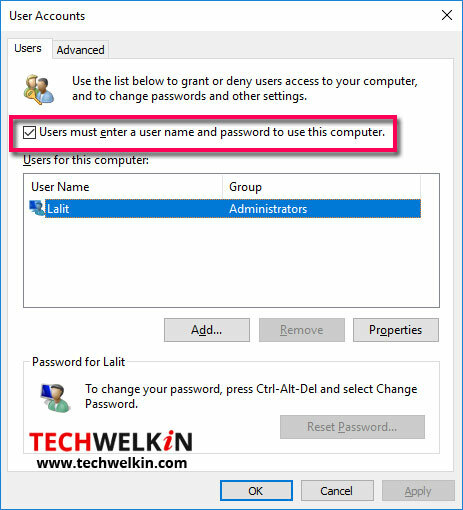 Today we will tell you how to skip entering the password on a Windows 10 machine. Before we begin, it is important to inform you that this action will leave your computer accessible to anybody. So, you should go ahead only if you’re sure that nobody can physically access your computer except you. Removal of password screen may prove to be useful in case the computer is locked in a room where no one goes in your absence. Home computer and computer in a lockable office cabin could be good candidates for removal of password. Press Windows + R to bring up the Run dialog box. Type netplwiz command in the Run box and press Enter. User Accounts window will open up. Uncheck the checkbox that reads “Users must enter a username and password to use this computer”. You will be asked to enter your password twice. Now, users will not need to enter password on this Windows 10 computer. This method works perfectly fine on both desktop and laptop computers. As we said, complete removal of password may not be a good idea in most cases. Alternatively, you could keep a simpler and easy to enter password. Well, simple passwords are not really secure but certainly better than no password at all. Let us know if this tip was useful for you. What are your views on removal of password? Thank you for using TechWelkin!